Easter is quickly approaching, and as with any holiday that promotes entertaining, many of us are scurrying around at the last minute Googling recipes and finalizing shopping lists. Usually the last thing that comes to mind is what to drink. To help ease the anxiety, I thought I’d put together a couple fail-safe suggestions that will put both you and your guests at ease with something appropriate for the season: pink wines. Pink wines are a great option for sipping in the afternoon or accompanying an Easter brunch. Most rosés are made by letting grape skins “mash up” (or macerate) with just-pressed grape juice for several hours. Once that mixture is strained, the result is a wine with all the delicious juicy strawberry and cherry flavors but without the bigger tannins that come with a longer maceration process. 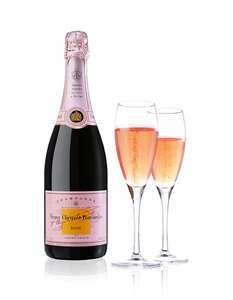 Rosé Champagnes on the other hand are most often made by adding in a small percentage of red wine to give the wine color, body, depth and character. Whether you are looking for bubbles or not, there are a bounty of delicious rosés just starting to hit the market. Every year around this time, I venture to my favorite wine merchant and fill up a mixed case of rosés to keep on hand for occasions just like this. Below are some of my favorites. From the people that brought you one of the most recognizable champagnes in the world (I’m sure you’ve seen the “yellow label.”) The often overlooked rosy big sister is equally delicious. The non-vintage rosé is made of approximately 10-15 percent red grapes, with Chardonnay making up the difference. Great for sipping on its own or with the meal. The little guys in Champagne are often overlooked because they lack the name recognition, “bling” and hype that surround some bottles and brands. Vilmart is one of those little guys and isn’t found in most major markets. They are family owned, and their money goes into what’s in the bottle, rather than how the bottle is packaged. The Cuvee Rubis is their non-vintage rosé made from 90 percent pinot noir. It’s aged for a short time in a barrel, with extra TLC giving it added depth and beauty. Coming from one of the most beautiful wine regions in the world, this is one of my go-to rosés. Made from 100 percent Cabernet Sauvignon, this wine packs delicious, ripe fruit characteristics that make it the perfect picnic wine to sip in the late afternoon as the sun sets. My rule of thumb: once the sky matches the color of my glass of rosé, it’s time to move on to red. From the northeast corner of Italy comes one of the first rosés that really converted me. It’s made from a grape, Refosco, which is most commonly encountered in its red form that I would categorize as a winter wine, best enjoyed fireside on a snowy evening with a delicious braised supper. The rosé, however, is the exact opposite and is perfect for springtime afternoons in the sun. And if wine isn’t strong enough…. The other night I found myself at home with four Ruby Red grapefruits at their peak of ripeness, a fully stocked liquor cabinet and a room full of dinner guests. The crowd was getting restless (and thirsty) as I prepared dinner, so I threw them an “Iron Bar Chef Challenge” to craft cocktails as I slaved over the stove. Within 5 minutes we had juiced the grapefruits, sweetened the juice with a touch of agave syrup (simple syrup would work too), poured generous portions of local gin over ice in rocks glasses and added sprigs of rosemary as stir sticks. We had ourselves a party. 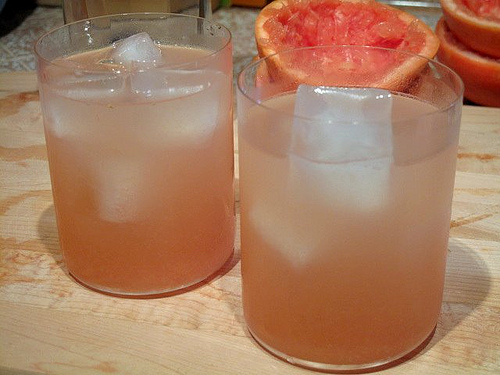 And if there are kids around that want to partake in the grown-up fun, pour them grapefruit juice in a champagne glass and top it with soda water. They will feel like royalty. COMMENTS ON "Drinking Pink with Peter Cottontail"